The work of custom toy creator Christian Hooton is no stranger to Kotaku. Whether it's StarCraft or Portal, Hooton's craftsmanship dazzles. 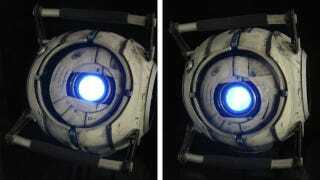 Check out his latest creation: a 7-inch Portal 2 Wheatley light-up toy. Hooton worked about a month to finish the Wheatley, which is made from lightweight plastic and has a moveable center "eye" that also lights up. According to the sculptor, "The weird thing about this one is that it's dangerously close to able to be used as a puppet. The eye is mounted on a gyrroscopesque [SIC] hinged in the center of the ball, and there are thin fishing line like strings keeping it a neutral position." More photos on his blog in the link below.